iThmb Converter is developed to enable recovery of the images stored in your iPhone, iPod or iPad. If the pictures have been lost and the only copy you have left is in your iDevice Photo Cache, iThmb Converter will provide you the tools to open and convert ITHMB files into JPEG, PNG or BMP, thus retrieving the images. If you own iPhone, iPad or a photo-enabled iPod, you are most likely familiar with ITHMB files autocreated when you sync your iOS device with iTunes. ITHMB files essentially contain thumbnail images, and serve to make image viewing faster and reduce battery strain. However, being specific for iOS devices, they can also become a trap for your photos. 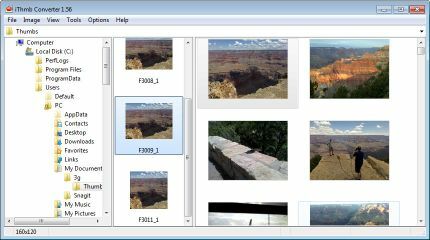 If that’s the case and you are looking for the Windows software to retrieve the precious images, look no more, because iThmb Converter has got just what you need! Sophisticated yet easy-to-use, the program will make image recovery a snap. You won’t have to go to the data recovery professionals, trust them with your data and pay crazy sums. In fact, with iThmb Converter you don’t even need to be tech savvy – the advanced software will extract the images and convert them automatically. The program allows converting ITHMB files into JPEG, PNG or BMP format. The images can then be easily viewed, copied, shared and edited. What is more, if you opt for JPEG, the resulting file will also contain Exif segment storing image metadata such as its rating, creation and modification dates and Photo Database category. This will come in especially handy for photo management, and can be very helpful when you are looking for a specific photo. The feature is also bound to be appreciated by forensics experts, providing them with more evidence in the case. If there is a Photo Database index file or Photos.sqlite available, iThmb Converter will automatically name the files and folders based on the database info, transforming the obscure T149.ithmb into something much more informative like 2010\Sea\Alice.jpg. The program also retrieves the information on the image size, and can be configured to automatically crop the pictures in order to get rid of the unwanted black spaces on the sides. Best part is that you don’t have to convert hundreds of pictures manually. iThmb Converter enables you to automate the process, so it won’t matter whether you want to retrieve a single pic or a family photo archive. Thanks to the batch processing the laborious task will become a matter of a few mouse clicks. All you need to do is to pick a folder or a single ITHMB file, select Convert All and specify the destination folder. The development team is constantly working on iThmb Converter, increasing the number of ITHMB file formats for decoding. You can help make the program better by sending an ITHMB file to the developers for further analysis. Copyright © 2011-2018 Dec Software. All right reserved.